Leukemias are a group of heterogeneous neoplastic disorders of white blood cells. Based on their origin, myeloid or lymphoid, they can be divided into two types. Leukemias traditionally have been designated as acute or chronic, based on their untreated course. Acute leukemias usually present as hemorrhage, anemia, infection, or infiltration of organs. Many patients with chronic leukemias are asymptomatic. Other patients present with splenomegaly, fever, weight loss, malaise, frequent infections, bleeding, thrombosis, or lymphadenopathy. 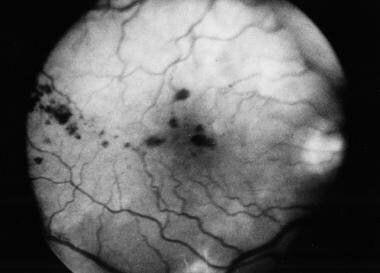 The image below depicts an impending retinal vein obstruction and intraretinal hemorrhage in a patient with chronic myelogenous leukemia. Some chronic leukemias enter a blast phase where the clinical manifestations are similar to the acute leukemias. Chronic myelogenous leukemia (CML) is characterized by an uncontrolled proliferation of granulocytes. An accompanying proliferation of erythroid cells and megakaryocytes is usually present. Many patients are asymptomatic but may present with splenomegaly, weight loss, malaise, bleeding, or thrombosis. Acute lymphocytic leukemia (ALL) is a malignant clonal disorder of the bone marrow lymphopoietic precursor cells. In ALL, progressive medullary and extramedullary accumulations of lymphoblasts are present that lack the potential for differentiation and maturation. An inhibition of the normal development of hematopoietic cell elements occurs. The clinical presentation is dominated by progressive weakness and fatigue secondary to anemia, infection secondary to leukopenia, and bleeding secondary to thrombocytopenia. When 50% of the bone marrow is replaced, then peripheral blood cytopenias are observed. Acute myelogenous leukemia (AML) is a group of neoplastic disorders of the hematopoietic precursor cells of the bone marrow. AML is subdivided by the French-American-British system into 6 categories depending on the morphology. AML is not a disorder of rapidly proliferating neoplastic cells. The time for one cell division is prolonged with respect to that of normal bone marrow blast cells. A failure of maturation of the neoplastic cell clone exists. The bone marrow is gradually replaced by blast cells. Therefore, the most important complications are progressive anemia, leukopenia, and thrombocytopenia. In leukemias, a clone of malignant cells may arise at any stage of maturation, that is, in the lymphoid, myeloid, or pluripotential stage. The cause for this clonal expansion is poorly understood in most cases, but it appears to involve some rearrangement of the DNA. External factors, such as alkylating drugs, ionizing radiation, and chemicals, and internal factors, such as chromosomal abnormalities, lead to DNA changes. Chromosomal rearrangements may alter the structure or regulation of cellular oncogenes. For instance, in the B-cell lymphocytic leukemias, chromosomal translocations may put the genes that normally regulate heavy and light chain immunoglobulin synthesis next to the genes that regulate normal cellular activation and proliferation. This results in proliferation of lymphoblasts. As the population of cells expands, the bone marrow starts to fail. Pancytopenia is typical and results in part from the physical replacement of normal marrow elements by the immature cells. In addition, the abnormal cells may secrete factors that inhibit normal hematopoiesis. As the bone marrow becomes replaced, the abnormal cells spill into the circulation and infiltrate other organs, such as the liver, the spleen, and the eye. Any of the ocular structures may be affected. Ocular involvement may occur prior to the diagnosis of leukemia, during the disease course, or as a sign of relapse. The ocular manifestations may be secondary to direct infiltration of the leukemic cells, as a result of abnormal systemic hematological parameters, opportunistic infections, or iatrogenic complications arising from chemotherapy. Clinical series show variable data regarding prevalence and incidence of ocular involvement in patients with leukemia. These differences arise from the differences in study design. In some studies, patients were examined at different stages of the disease. In others, ophthalmologists examined only symptomatic patients. In most studies, no distinction is made between the different leukemias. Despite changes in treatment and survival over the past decades, ocular involvement, as examined by histopathological methods, has remained fairly constant in the past 70 years. An estimated 300,000 new cases of leukemia (2.8% of all new cancer cases) are diagnosed each year globally. It has been estimated that in Western countries, CLL constitutes the most frequent type of leukemia with 25% of cases, CML represents 20% of cases, and AML represents 20% of cases. When all leukemias are lumped together, the global 5-year survival is 20%. In developed countries, 31% survive for 5 or more years, compared with 15% in developing countries. This underscores the lack of access to high-tech treatment in the developing world. In 2002, 222,506 deaths were reported globally, secondary to all leukemias. It was estimated that, in the United States during 2009, there would be a total of 21,870 deaths secondary to all leukemias. Deaths secondary to ALL and AML have been reported at 1,400 and 6,900, respectively. In children with ALL, 90% of patients achieve a complete remission, and up to 80% can remain disease free at 5 years following treatment. In adults with ALL, remissions occur in 60-80%, while 20-35% will maintain a leukemia-free survival. Currently, 65-70% of patients with AML attain remission. The 5-year survival rate during the period 1989-1994 was 43%. Secondary to CLL, 5,100 deaths have occurred; secondary to CML, 2,300 deaths have occurred; and secondary to other leukemias, 6,400 deaths have occurred. In CLL, the natural history is highly variable. The median survival is 6 years, and the natural history is not altered by therapy. Infection is the leading cause of death. The median survival of CML with treatment is 5 years. Granulocytic sarcoma of the orbit, also known as chloroma, represents an extramedullary site of AML or CML. Survival has been reported to range from 1-30 months after the onset of ocular signs and symptoms. Some studies suggest that the presence of intraocular leukemic infiltrates correlates with CNS involvement and with decreased survival. In the United States, ALL and CLL are more common in whites than in blacks. ALL: 3,350 cases in males and 2,410 cases in females; childhood ALL demonstrates a notable male predominance. Most childhood leukemias are acute. ALL is the most common malignancy in children, especially affecting those aged 2-10 years. ALL is seen in only 20% of adult acute leukemias and behaves more aggressively than the childhood type. AML constitutes 15-20% of acute leukemias in children. Incidence of AML increases with age; in persons younger than 65 years, the incidence is 1.3, and in persons older than 65 years, the incidence is 12.2. CML constitutes less than 5% of childhood leukemias. The incidence of CML increases slowly with age until the middle 40s, when the incidence starts to rise rapidly. Incidence of CLL is over 10 per 100,000 for persons older than 70 years but is less than 1 per 100,000 for those younger than 50 years. Mean age at diagnosis of CLL is 60 years.